Happy Christmas to you all - both to parishioners who keep this place going throughout the year and to our visitors from near and far! A big thanks to all who work hard to prepare St Bede’s for Christmas – our flower arrangers, our Church cleaners, our brass cleaners, our choir and musicians and the three wise men who assemble to two cribs. We give special thanks to all those who do the rotas and to those who read and serve and so many others. I hope all of you have a profound celebration of the Mystery of Christmas and a happy reunion with family and friends afterwards. Then especially to you Mums - have a good rest on Boxing Day! Christmas Offerings: : In the porch & around the sides of the Church are the envelopes for your Christmas Offerings for our 3 priests. As you are aware, a priest does not get a salary as such, & relies on the Collections at Christmas & Easter, as a primary source of income. These two collections are the only ones that are for the priests of the parish. Please be generous as your means will allow. Music for the Tridentine Christmas Eve Mass: The Mass will be Mozart Missa brevis in D K194; Offertory Motet: Laudate Dominum (Mozart) and the Communion Motet will be O Magnum Mysterium (Victoria). This wonderful music is provided by David Guest and his singers. The 12 days of Christmas lead us traditionally to the Epiphany and the liturgy for the next few weeks is meditating on the mystery of the Word made flesh. The implications of the incarnation are so many. All of creation is in some sense sanctified by the presence of God made man. That means that created matter can be a means to the end of union with God. Icons, statues and pictorial representation are all ways that we can appreciate the mystery of the Kingdom which is beyond representation. Nevertheless, with the coming of Christmas we can actually see the face of the Lord. New Years Eve: In this parish, we always begin the New Year with a solemn Mass to beseech the Divine Majesty for the graces we need in the New Year. Each one of us should make a New Year’s resolution to tackle some area in our life which habitually we may neglect. We will start at 10.30pm Exposition of the Blessed Sacrament and Confessions; 11.30pm Solemn Te Deum and Benediction followed by a sung Midnight Mass. 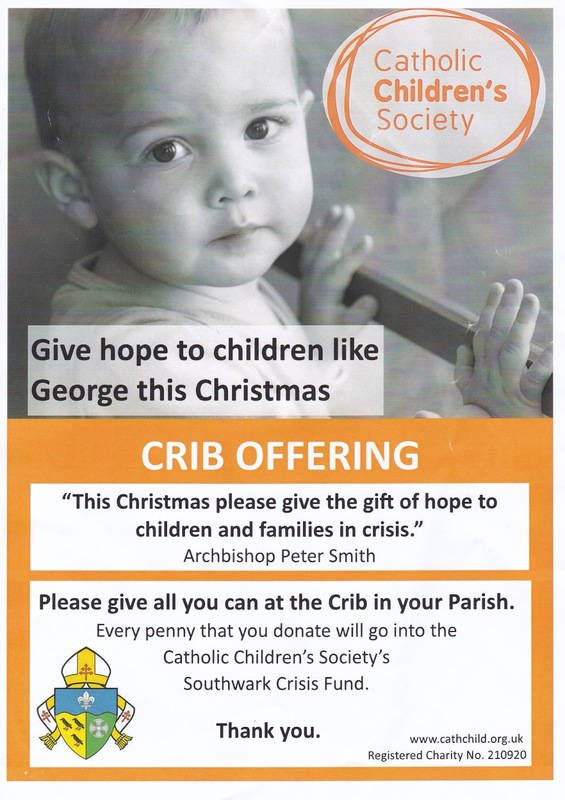 Crib Offerings: This year's Diocesan chosen charity for crib offerings is the ‘Catholic Children’s Society’. They deliver ConnectEd school counselling services across the Diocese of Southwark to help children and families living in emotional and relational poverty. 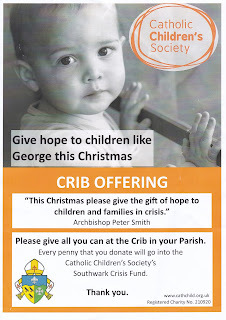 Therefore this year we will split the offerings made equally between Good Counsel Network (whom we have sent them to for many years) and Catholic Children’s Society. Welcome back to Fr Andrew Southwell: who has returned to spend Christmas with us. Christmas Party for the families of our Altar Servers & Readers: This coming Wednesday (27th) we will have a Mass at 10am followed by a small party in the club afterwards. Please bring some finger foods to share. 2018 Diocesan Directories & Diaries on Sale: Diaries cost £1 each and the Diocesan Directories cost £3 for standard bound and £3.50 for the spiral bound version – these have the liturgical calendar for whole year, Mass times for every parish in the Diocese and lists of every Priest, Bishop, Deacon, School, Convent and Catholic institution within our large Diocese, and also all the statistics and guidelines. Buy one today! New Readers Rota: Please note that this rota includes the weekend of 30th /31st December which was omitted from the last rota by mistake. Cleaners Rota for this week: Lucia Rojas Calero, Jose Lozano Rojas & Ana Paladines Palacios . The rota for Jan-Jun 18 has now been posted out to home addresses.